Karin practiced Vipassana meditation for many years before she began studying Hatha Yoga and Tantra Yoga in Sweden in 2011. When she found Hridaya in 2014 it felt like a beautiful combination of her previous practices—she definitely had a feeling of coming back home to the Heart, falling in love! She has stayed and taught at the Hridaya Yoga Center in Mazunte since graduating from the Hridaya Teacher Training Course in 2016. In addition to being a Hridaya teacher, Karin is also a graduate of Durga’s Tiger School Tantra Yoga Teacher Training (based in Ecuador). She has also worked as a social worker specializing in sexual education and was a comic strip artist. Now, she combines all of her experiences with her passion for play, contact dance, and improvisational theater in her soul project, Way of Play. Meditation, yoga, and Tantra all lead to being present in a non-judging, mind-free state of happiness, and so does play! When playing and dancing, this awareness happens in movement with open eyes. For Karin, play has been a beautiful way to bring the state of naturalness and flow into daily life. 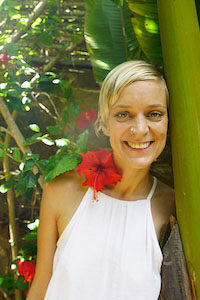 Through Way of Play she offers a variety of workshops, solutions-based counseling, and individualized yogic coaching. If you want to drop the ego and mind, a great path is to dare to be silly, spontaneous, and have fun! It’s also great to understand the ego through counseling and get help adjusting your practice to your specific blockages and chakra activations. And, that is the point of Way of Play!